September 20, 2014. The latest data from the Census Bureau for 2012 show that while NYC median family incomes and poverty stabilized last year, we are still a very long way from undoing the deterioration caused by the 2008-09 recession. 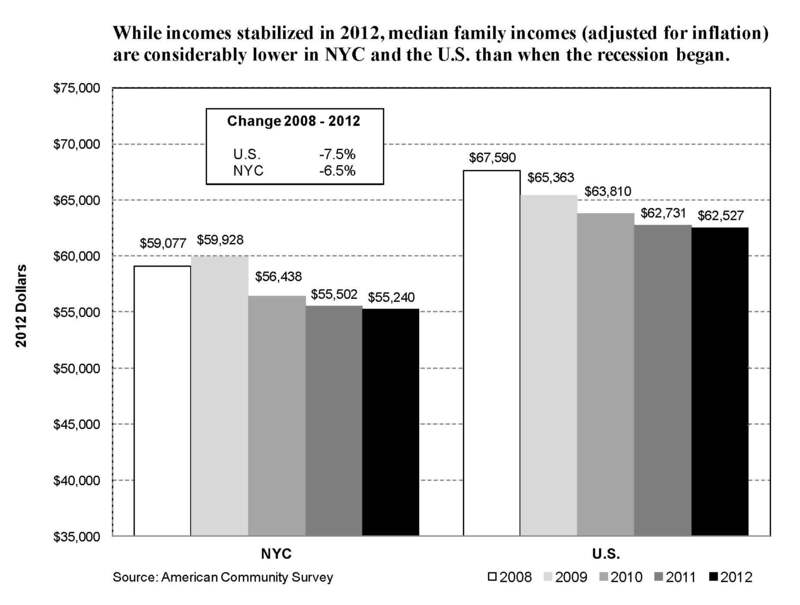 Most NYC families have been battered by the recession and the historically weak recovery. Adjusted for inflation, median family incomes dipped slightly in 2012 (but not significantly) and are $3,800 or 6.5% below the 2008 level. Nationally, inflation-adjusted median family incomes dropped by $5,000 or 7.5% from 2008 to 2012. This income erosion among NYC residents results partly from a 2.8% drop in real median wage earnings, which fell by $1,000 from $35,000 in 2008 to $34,000 in 2012. This drop, in turn, stems from a disproportionate increase in part-time employment. Median wage earnings for both men and women working full-time, year-round, have risen by about 3% in inflation-adjusted terms over the past four years. On the other hand, the percent of the working age population that is employed was 56.8% in 2012, considerably below the 58.7% from 2008. NYC’s poverty rate climbed from 18.2% in 2008 to 21.2% in 2012, an increase of 3.0 percentage points, more than for the nation as a whole. The U.S. poverty rate went from 13.2% to 15.9% over this period. Although there was a slight uptick in NYC’s poverty rate in 2012 compared to 2011, it was not a statistically significant change. 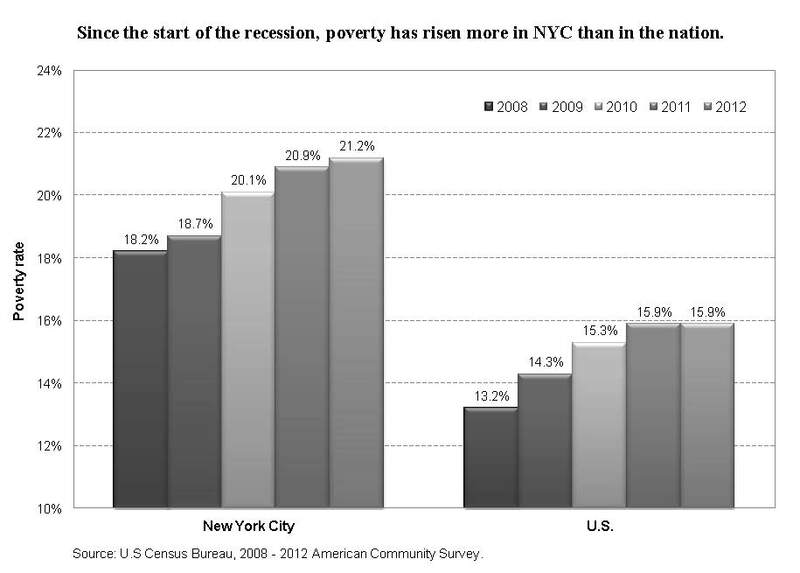 The poverty rate among New York City’s children has risen faster than the overall increase. In 2008, 26.5% of the city’s children were growing up in poverty households. By 2012, that number had risen to 31.4%. The number of city residents living in “deep poverty,” considered to be half the official poverty threshold, increased from 2008 to 2012 even faster than the city’s overall poverty increase. Since the start of the recession, 243,000 more city residents have fallen into poverty, bringing the total to 1.7 million out of a population of 8.2 million. For 2012, the federal poverty threshold for a 3-person family was $18,284. In 2012, 410,000 workers, or one out of every 10, were paid wages that kept them in poverty. These 410,000 constitute the “working poor”, i.e., those who work either part-time or full-time but whose earnings are too low to lift their family incomes above the poverty line. Reflecting the widespread hardships induced by the recession and slow recovery, the share of the city’s population receiving food stamps jumped from 14.9% in 2008 to 21% in 2012. The city desperately needs the sort of recovery that shares the fruits of economic growth with all workers, rather than continuing to be heavily concentrated in the hands of a small elite. According to the latest Census Bureau data for 2012, there has been no significant lessening of New York City’s extreme inequality since 2007.